ANOTHER TRACK TAKEN FROM THE FORTHCOMING ALBUM FROM MR SPARX, “TROOPER”. THIS ONE A JUMP UP PARTY SMASHER SURE TO GET THE FEET MOVING!! QUALITY OUTPUT AS EVER FROM ROB!! 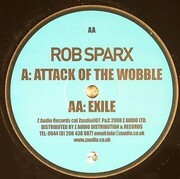 - "Attack Of The Wobble"